I love Sydney in November. It’s when the streets bloom purple with jacaranda flowers. From the Rocks to Kirribilli, jacaranda trees will put on their finest and shower the city in lilac. You will see flashes of purple dotted around the place and some streets will be covered with purple flowers. It’s something I did not see growing up in Tasmania. I thought they were native to Australia. But I was mistaken. The tree is a migrant, like me. It originated in Brazil and spread across the globe. They say it is found in places like South Africa and Spain, in Pakistan and Zimbabwe. It came to Australia around about the 1800s. According to the Sydney Living Museums, an early source credits plant hunter and colonial botanist, Allan Cunningham, who was sent from Rio de Janiero to New South Wales. After travelling the world most of his adult life and exploring vast expanses of Australia, Cunningham died of tuberculosis in Sydney in 1839. The jacaranda is an uninspiring tree most of the year. Some may say it looks a little unkept and scraggly. It’s an ordinary tree with a hidden beauty that reveals itself in November. 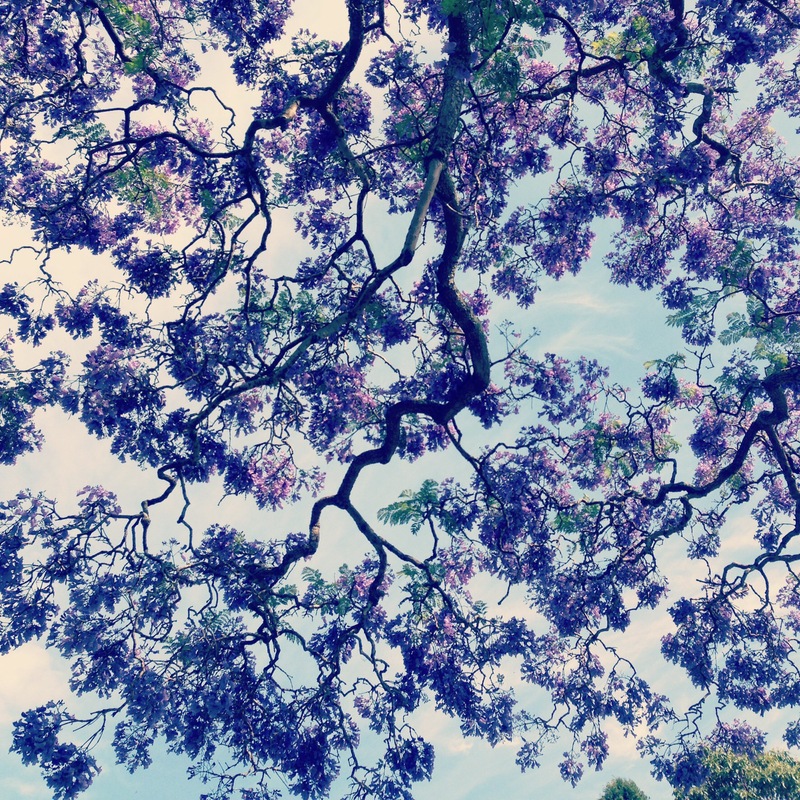 For university students across Sydney, jacaranda season means stress, study and work. It heralds exam time. There is a superstition attached to a well known jacaranda tree at the southern end of the University of Sydney’s quadrangle. It claims students are likely to fail their exams if their books are still closed and untouched when the tree blooms. By the time the blooms fall, they say about 33,000 students at that university would have sat more than 200,000 exams. The original tree died in 2016 after 88 years, and was replaced with another. They also planted a flame tree next to it. A native of this country, the flame tree flowers around the same time and was planted as an acknowledgment of Australia’s First Peoples. For me, jacaranda trees signify something different. They remind me of my son. 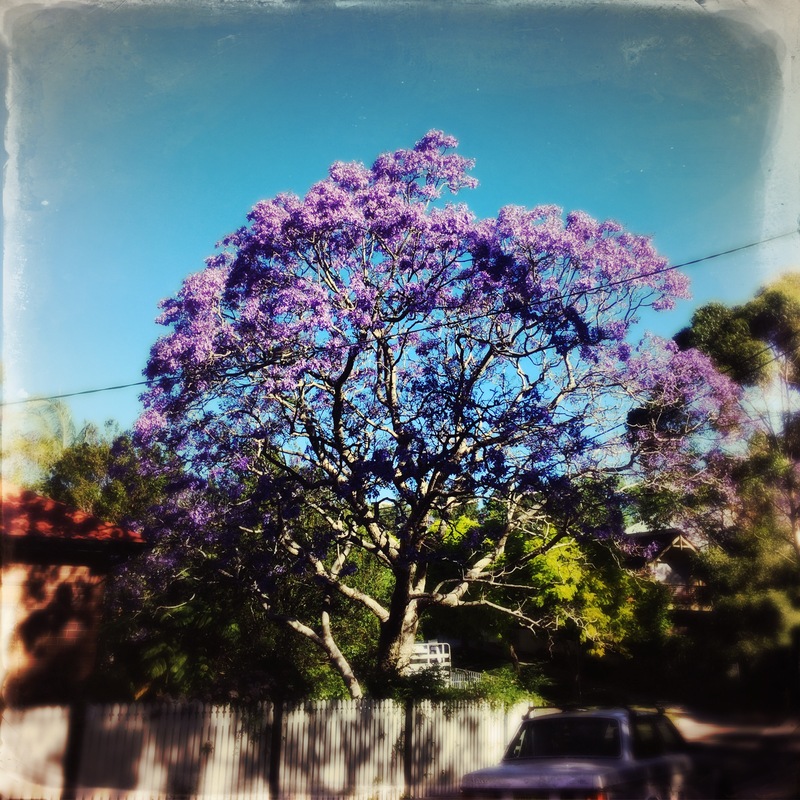 We once lived on a street lined with jacarandas. This time, eleven years ago, when the neighbourhood seemed soaked in purple, we welcomed our son into the world. We left the hospital, bundling this tiny human into our car and drove home terrified by the love and responsibility before us. It seemed my husband drove more carefully than usual, conscious of the new life in the back seat. Our son was only a few days old. And we had no idea what to do. As we turned the corner to our street, a cloud of purple flowers greeted us. The sun was shining. The sky was blue. We gently took our new son out of the car and into our lives. For me the month is forever associated with our boy and the flowers that welcomed him home. Jacarandas are his trees. Sydney is his city. His hometown. There’s something so poetic about a tree which blooms only in a single month and I loved the different meanings you described it holding among those familiar with it. I do not normally read long blog posts. One or two paragraphs stops me. But when you gave some history of the jacaranda tree I was interested. The jacarandas were everywhere in Ipswich(near Brisbane) when I was a young person.There was something nice about them. I think Lismore is very well known for them as well.I know this is random but I recently did some research online about the walnut and brazil nut trees. Very interesting esp what a Brazil nut pod looks like. I enjoy the tree very much. Something about that bloom of purple flowers makes me happy. I envy that you were able to grow up with it in Ipswich! What a lovely view to welcome your son to this world. It was a happy and slightly scary time!